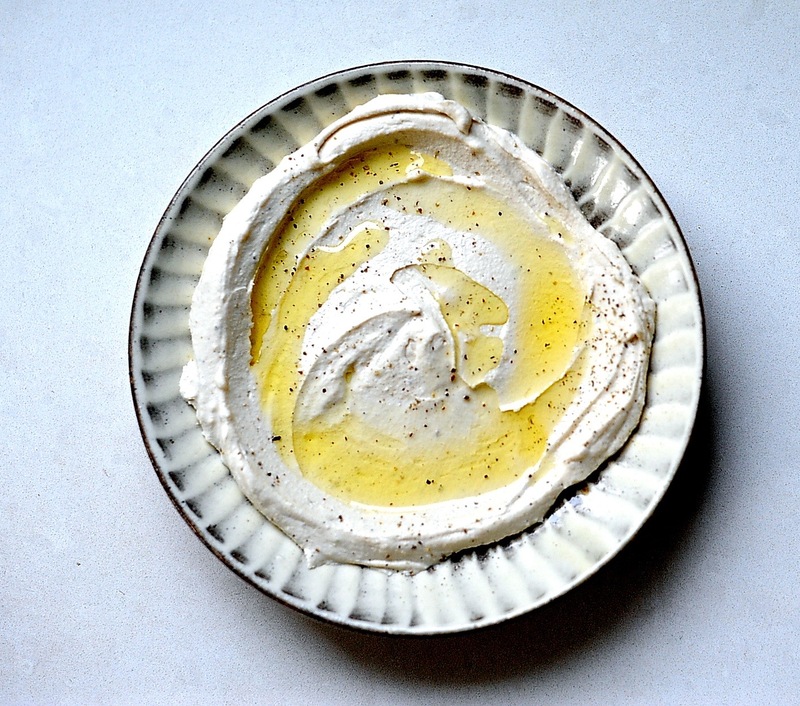 This Vegan Labneh recipe tastes, hand to god (as my Grandma Eva would say) just like its dairy counterpart. I threw in a fresh pita recipe good pita is so difficulty to find outside of the Middle East. 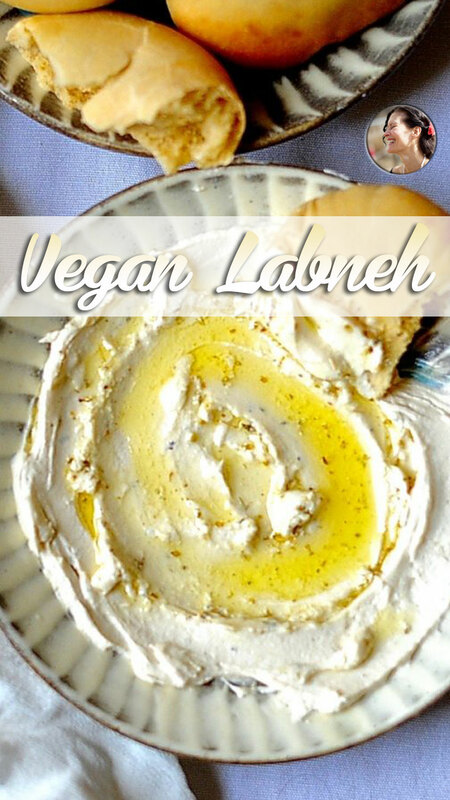 What is Labheh and how can you make it vegan? I am directly quoting my daughter’s friend here. Lol! 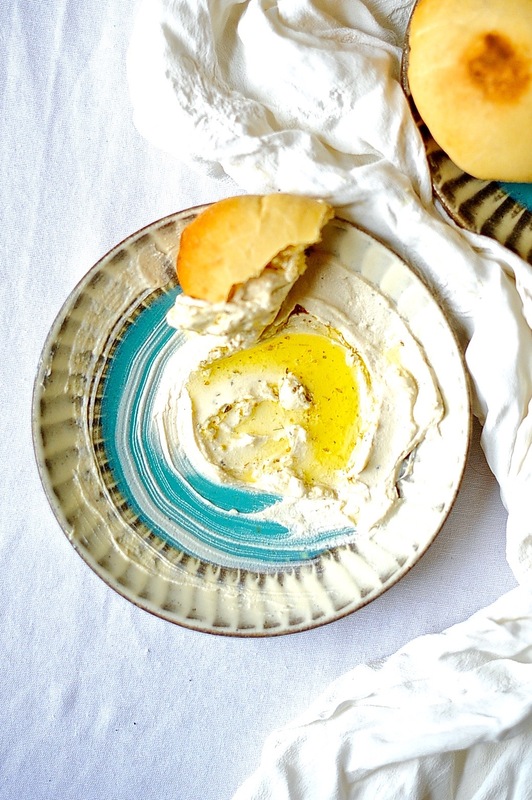 Labneh is a tangy, silky Levantine cheese spread that can be served as a dip with pita bread or smeared on a toasted bagel. 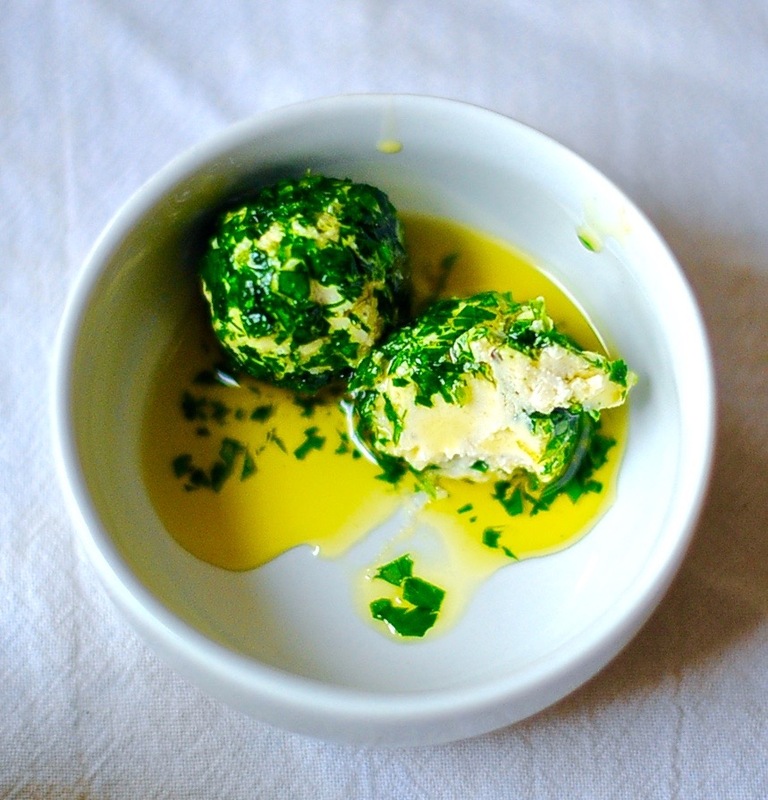 The cheese can also be rolled into balls, encrusted in herbs, and preserved in golden olive oil. 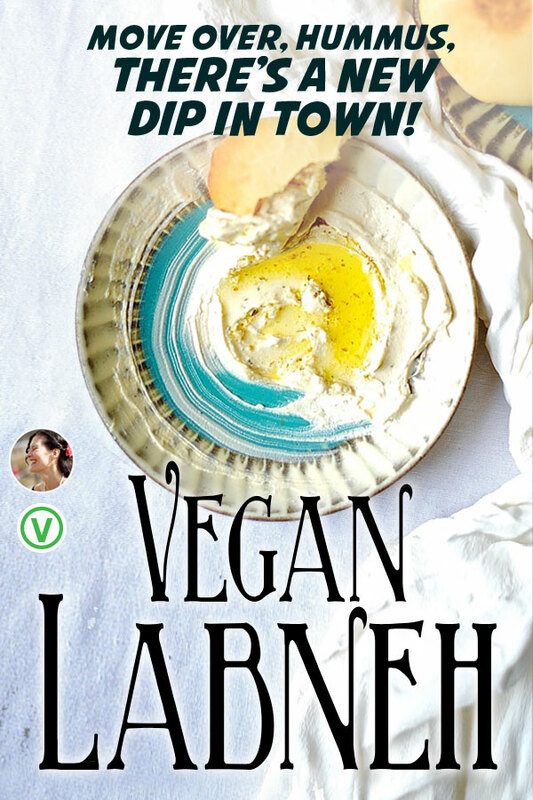 Vegan Labneh is made the same way as its dairy counterpart. You simply curdle the milk (cashew milk) with an acid (lemon juice0 and that separates the curds from whey. Then you wrap it in cheese cloth and allow it to drip out most of its moisture. In winter there was rain that fell for days without end and pulled from the almond trees green fruit so tender that you wanted to cup them with your hands and protect them like the fuzzy heads of newborns. This seasonal memory is one of the corners where my husband’s and my childhood intersect, he on a kibbutz in Israel and me on an island in Greece. My mother would mix lemon juice and salt into our leftover yoghurt, wrap it in white linen and hang it from a hook until it had drip, drip, dripped out all of it’s whey and become an impossibly tangy, thick spread. As we had no refrigeration this alchemy was both practical and delicious. Vegan Labneh rolled into balls and coated in herbs. 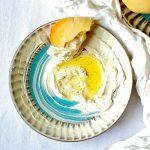 In Israel a sloe eyed yemenite friend showed me how to salt sheep’s milk yogurt, roll it into small, herb encrusted balls and preserve them in jars of golden green olive oil. This she taught me was called Labneh. We cooked as we danced to the radio in her tiny kitchen, twirling and laughing. Both Hanaan and I grew up with the tang of fresh white cheese spread on our bread. One spring as I was running through the newly greened hills of Jerusalem I heard the bleating of goats in the still air. Following the sound, I left the dusty, sun beaten path and entered the cool of the forest. There beneath the pines, a beduin tent had sprung up between the pink cyclamen blooms. A young woman called to me. I stopped my running and salty with sweat approached her. She stood in robes that flowed like dark water, beckoning me to follow her into her tent. She and her mother plied me with green mallow soup, flat, fire-scorched bread and thick creamy goat cheese. They fed me with their own hands like a baby bird, laughing at my clumsy attempts at eating one handed with no utensils but a piece of torn bread. 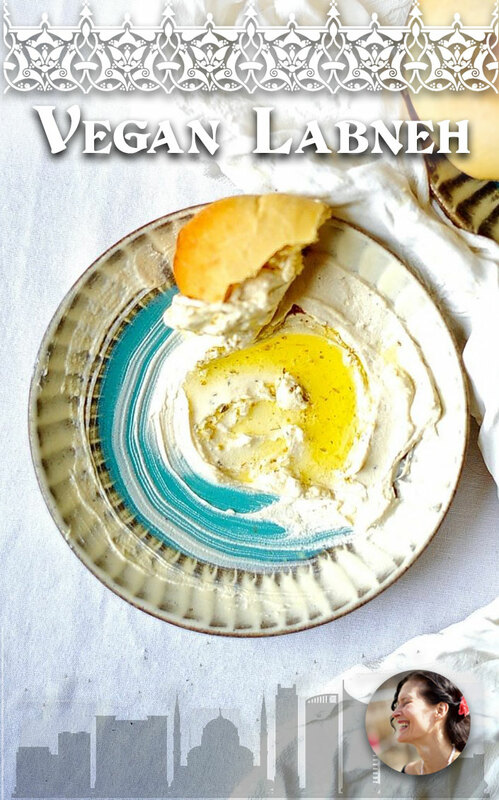 Labneh is a tangy, silky cheese spread that can be served as a dip with pita bread or smeared on a toasted bagel. If you have the time make your own pita bread, do so, it is well worth it. The Labneh takes about 24 hours inactive time for soaking and draining but only a total of about 30 minutes active overall. If you have a Vitamix or other high speed blender you can cut the process down by 6-7 hours. Soak the cashews in the water for for 8 hours or overnight. Speedy hack: If you have a high speed blender then you can blend the heck out of the cashews and water and let them sit for an hour and blend them again for a few minutes. Until smooth. This shortcut does not work with regular blenders! After 8 hours, puree the cashews and soaking water in a blender until totally smooth. Rub a little between your fingers and if it is coarse then blend some more. Heat up your cashew mixture in a saucepan until quite hot to the touch but not boiling or bubbling at all. Remember to stir as you don't want the cashew concoction to scorch! Remove from the heat and gently stir in the lemon juice, vinegar and salt. Allow to sit undisturbed for 20 minutes. Line a sieve with cheese cloth or do what I do and use an unbleached white cotton t-shirt that I have cut up. Place the cloth lined sieve over a bowl to catch the whey. Gently pour the cashew curds into the waiting sieve. Place the whole contraption into the fridge for 8 hours. Lightly weighted. Now you should have something that is as thick as greek yoghurt. Pour out any whey that has gathered in the bottom bowl. Place a bowl on top of the curds to gently press out more liquid. 6-8 hours later you should be good to go. Remove your curds from the cheese cloth, place in a bowl and add the nutritional yeast, garlic powder, onion powder, sugar, minced garlic, mustard and salt to taste. Whiz it with an immersion blender (or use a regular blender) until completely smooth. 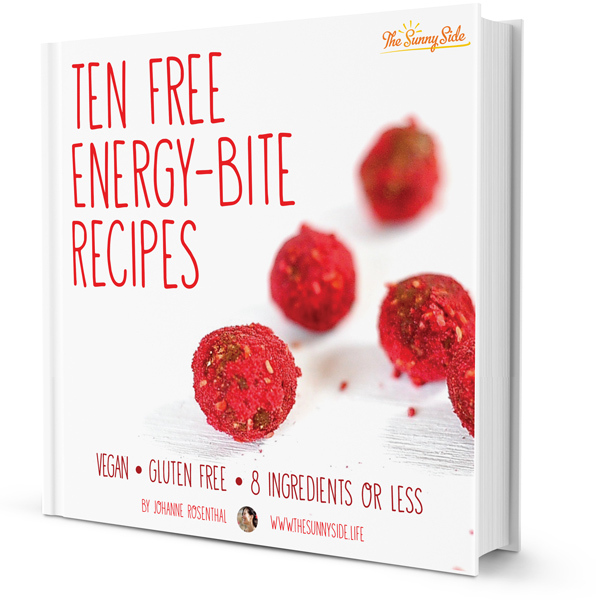 You can now store it in the fridge or roll it into balls and the coat in finely chopped herbs. The flavors mellow after a couple of hours in the fridge. I like to spread it in a shallow dish like you would hummus. Splash some really good olive oil over the top, and sprinkle with za'ater and fresh black pepper. 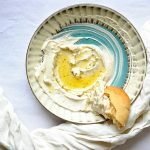 These pita have a wonderfuly fluffy texture and are so easy to make that even a novice baker will end up with a delicious product. If you've never tasted fresh baked pita you will be in for a shock, the good kind. Place warm water in a medium bowl and sprinkle the yeast over. Let sit 10 minutes. Mix in sugar, salt, olive oil and the whole wheat flour and mix till combined. Add the all purpose flour and stir till you have a cohesive ball. Knead that ball on your counter with scant additions of flour to keep it from sticking. Lightly oil a large bowl and place your ball of dough inside turning once to coat with oil. Cover with a damp cloth and place in a warm spot to rise for 1 hour. Uncover your dough and ploop it gently onto a lightly floured counter. Turn your oven onto 500 degrees fahrenheit. Place pizza stone or a large sheet pan in the oven to heat up. Cut you dough into 8 pieces. Form them into balls and roll each ball out to a 1/4 inch thickness. Cover with a cloth and let rest 20 minutes. Place half you rounds into the oven on your pizza stone or hey sheet pan. Allow to bake 3 minutes and then remove from oven and place immediately into a bowl lined with a towel. 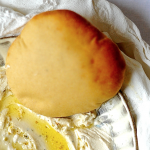 Place a towel over the newly baked pita, this is important for the formation of the pocket. Bake up your second batch of pita and place in the bowl with the first batch covering immediately with the towel. Let sit 7-8 minutes and enjoy! I was inspired by the http://plantepusherne.dk recipe for almond milk cream-cheese. 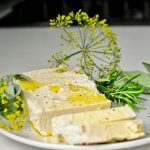 This recipe has stood me in good stead and gave me the confidence to experiment with cheese making again as a vegan. Nina’s recipe for butter is beyond compare as well! Also the best Vegan cheese I have ever tasted is made and sold by a one woman company in Israel and called Einut’s. 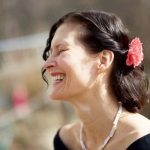 She has no strange ingredients in her products and the textures and flavors are sublime. All these years and an ocean between us and we are still connected. Once again: I’m salivating…… gorgeous memories poking all senses. Thank you Radhika, I’m glad we’ve “met”. Thank you for suggesting a t-shirt as a substitute for a piece of cheesecloth! If I had to go out and find cheesecloth I probably wouldn’t do it. Sheer laziness. I have all the ingredients and plan on making this tomorrow. What’s in za’ater? Thyme and that kind of thing? Just want to get a sense of the kind of herbs to rustle up from my spice cabinet. I recommend repurposing a spouse’s t-shirt. T-shirt herds often need culling. As to Za’atar. Good question! Za’atar is two things. It is an herb that we commonly call hyssop in English. It is also a spice blend containing but not limited to sumac (the sour herb not the poison ivy), sesame seeds, salt, thyme etcetera. Really there are no hard and fast rules just a pleasing blend. As I’m typing this, I’m looking out over mist-covered mountains, and longing for warmth and sunshine – your blog is just the thing! Those mist covered mountains are waiting for spring as well. Lucky you with such a view! This one encapsulates so much. Thank you I needed a laugh! When I return from the holy land dusty and sunburnt, I cannot wait to forgo the pita and spoon this directly into my mouth while repaying you in stories of my travels. Holy Olivia with a halo of bronzed hair, an icon at my table. I will listen and learn and love you. 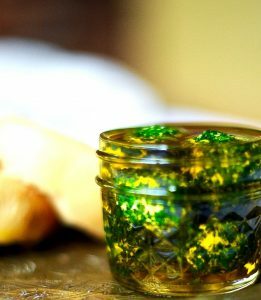 beautiful post and great recipe! Practical question: Can I sub the vinegar with more lemon juice? Thanks for the recipe and for sharing the memories! Thank you! Yes absolutely you can substitute. It alters the taste a bit but I love the taste of a good apple cider vinegar. Do you mean mustard powder, or from a jar of ready made mustard? Hi Rosemary I mean ready made mustard. Hi 🙂 Can’t wait to make this. With mustard, is dijon okay? Or a strong german mustard you mean? Also what herbs did you roll the balls in? I want to make it exactly like your balls as it looks amazing. I rolled the balls in finely chopped parsley.Dijon mustard its perfect! I’m sensitive to cashews…Can I substitute the cashews with almonds or another nut?? Yes I have made this with almonds and it is delicious.